A Sprinkle of Life – Page 13 – Exploring the world around me, sharing a sprinkle with you. A rental service for dresses, accessories, and outfits. They carry a ton of different designers from Kate Spade, Badgley Mischka, and everyone in between. When you rent a dress, you’re allowed to choose two sizes, at no extra cost, so you can try the dresses on at home and make sure you get the right fit for you. I had been meaning to try them out for a couple of years, but after college I didn’t have many events that called for a fancy dress. This past year however, the wedding invitations poured in and my boyfriend suggested I finally give it a try. We had a mutual high school friend’s wedding this past fall so I decided to go for it. I found a great dress and was super pumped to see how it would look, but that’s where the excitement ended. My dress was scheduled to arrive two days before we left, I had a UPS tracking number and it showed everything was looking good. I should note, I live in the same town as the Rent the Runway factory where they ship all the dresses out. I assumed the whole rental was going to be easy peasy and everything would go smoothly, but boy was I wrong. UPS showed my dress was out for delivery by 8pm (our complex is the last stop for UPS as we’re also in the same town as the UPS shipping center). 8pm came and went, as did 9pm. I started to freak out. My boyfriend called UPS and said we would pick up the dress in person the following morning when they opened up.The next day we went to UPS and the man at the front desk said they didn’t have the package. Apparently Rent the Runway was (or maybe still is) known for not placing labels on packages securely. They mentioned that this was a frequent occurrence where the labels would fall off and the delivery person wouldn’t know which package was which so they would just bring the clothes back to Rent the Runway. We then spent the next day calling Rent the Runway, emailing, and tweeting them. No one answered. Twitter showed a lot of people were also missing their dresses. We even offered to go to the warehouse to pick up the dress in person (they have a store where you can buy the worn dresses from them as well – I’ll do a review one of these days) but they said that they wouldn’t be able to give us my rental dress. I was crushed, and luckily had a backup option. Rent the Runway gave me a coupon code for my next rental and refunded my purchase after a few days of harassing them. As I opened the garment bag I started to get really nervous. Is the dress going to fit me? I chose to order a second size (for free) just to be safe, and I also found the dress being sold at a department store online and checked out the size guide there so I felt I had a fairly decent idea of what size would work best. 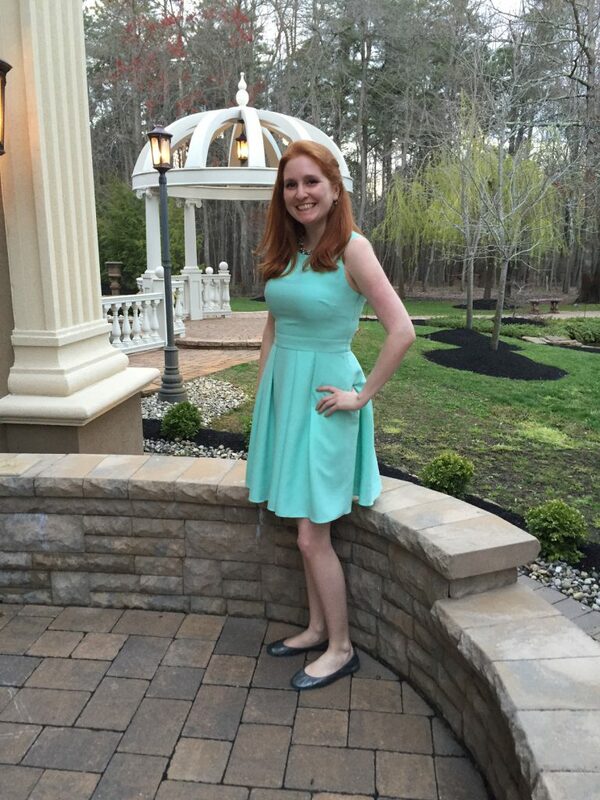 Thankfully, both dresses fit (the bigger size was a little too roomy so I opted for the smaller size). That weekend, I got nothing but complements on the dress. Everyone loved the color and thought the cut and fit was absolutely perfect. No one could believe I rented it! With my coupon code for RtR’s previous blunder, and the Pro account I bought (covers insurance and shipping) I got the dress for $35! That’s a steal when the dress itself costs $348 at retail. 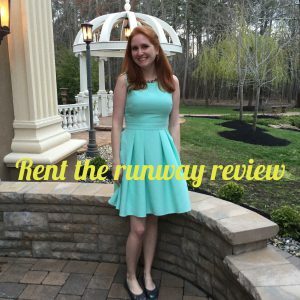 Would I use Rent the Runway again? Yes, but always with apprehension. I suggest that you always have a backup on hand because you never know what might happen. The dresses I received were in perfect condition, so I definitely trust the quality. If you can get away with it, try the 8 day rental option for your first order so that if something does go wrong, you might be able to get through to customer service in time for a new dress. Have you rented from Rent the Runway? 7 Years by Lukas Graham – Super catchy song that makes me think about where I am in life and how the years are flying by. I need to start slowing down and enjoy the world around me. Tour Group (tv show on Bravo) – Ok, it’s not the best show, but I love travel shows and with summer around the corner this show is getting me in the mindset to plan a vacation, which I’m really bad at doing. Below Deck Mediterranean (tv show on Bravo)– Not as good as the original Below Deck series but it’s got Chef Ben who is one of my favorite members of the crew. Papyrus Cards – Since May plays hosts to Mother’s Day I had to give Papyrus a shout out. Papyrus greeting cards are the most beautiful cards out there, hands down! 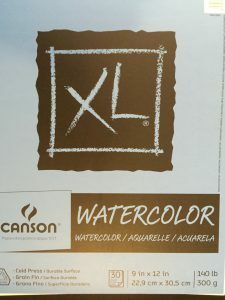 I was first introduced to these beauties in my college bookstore and then I visited a stand alone Papyrus store when I lived out in California. My grandmother has quickly fallen in love with receiving these cards from me so I always make sure to go out of my way to scout down the prettiest Papyrus card I can find. Sending cards has always been something I’ve enjoyed and I’m glad there’s something a little “extra special” available in the greeting card aisles. Hamilton (Broadway Musical)– My boyfriend surprised me with tickets to the musical to help celebrate my recent promotion. I’m specifically obsessed with the King in the show and can’t get his funny antics and songs out of my head. The show is worth the wait and cost! I’ve been meaning to try watercolors lately since the last time I recall using the medium was when I was a small child in art class. 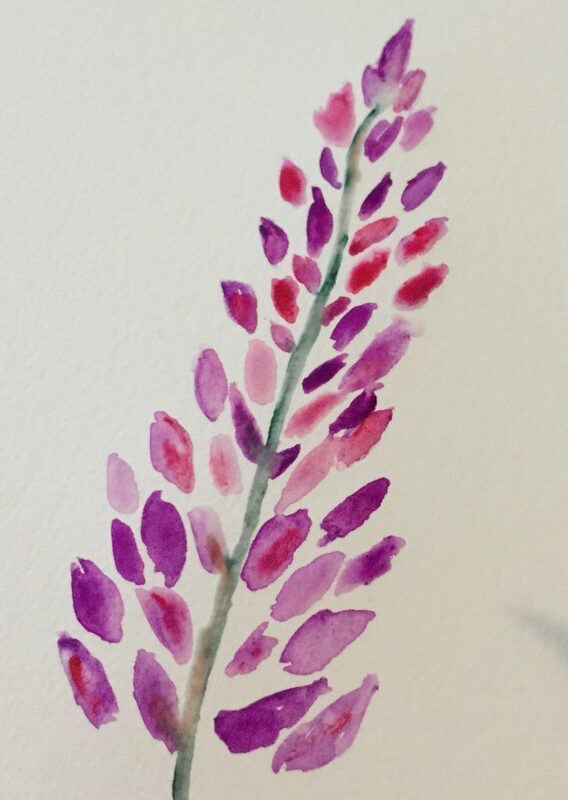 For my first watercolor post I wanted to share a very basic, safe for beginners, watercolor painting of Lupine flowers – a beautiful wildflower. 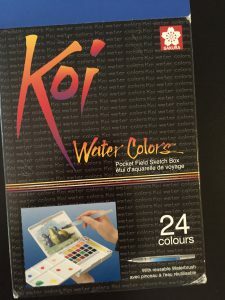 This Koi Water Colors kit comes with everything you need, including a water color brush that you fill with water! Lupine flowers are kind of coned shaped with a bigger base of buds at the bottom with progressively smaller buds as you move up the flower, forming a point at the top. To get started we’ll pick a color and make imperfect tear dropped or oval shapes. Continue making ovals and teardrops, moving up the paper creating a cone shape. 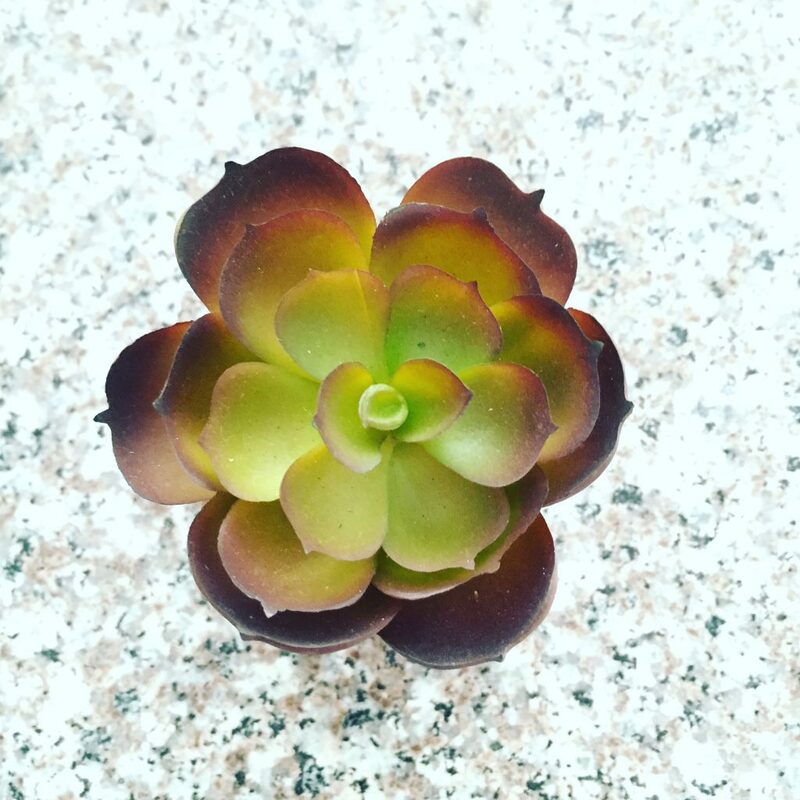 Consider adding a second color to your buds to add a little depth or movement. The color will disperse throughout the bud since the blue paint is still wet. Let the paint do it’s thing! Perfection is not needed with watercolors. Once you’ve created a cone shape, create a light colored stem to bring your Lupine together. If you’re like me you still have some gaps to fill in around the stem. Simply add more buds. Once you have one Lupine flower, add additional ones to fill your paper and create a nice landscape. It doesn’t have to be fancy, but adding different colored Lupines is recommended. 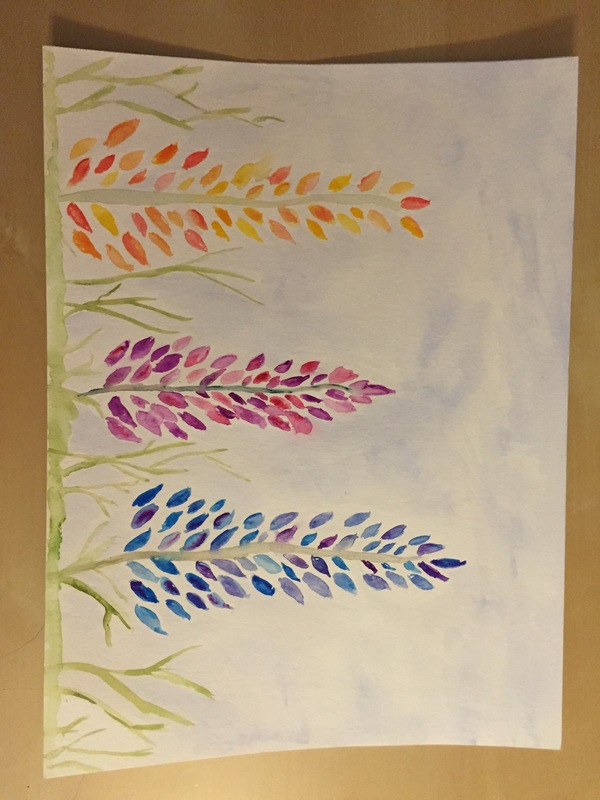 Once you have 3-4 Lupines, add some grass at the bottom of your painting. 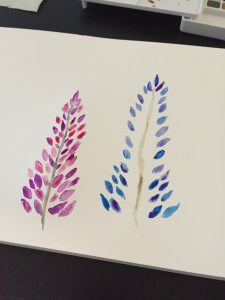 Optional, add a blue background/sky by wetting the paper extensively and smoothing a blue paint across the paper, watering down the color so it’s pale and almost translucent. And voila! 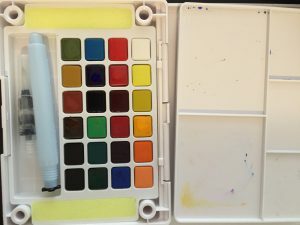 Before you know it you’ve got a simple watercolor painting completed! An Honest Tieks Review – Are they comfy? Do Tieks smell? 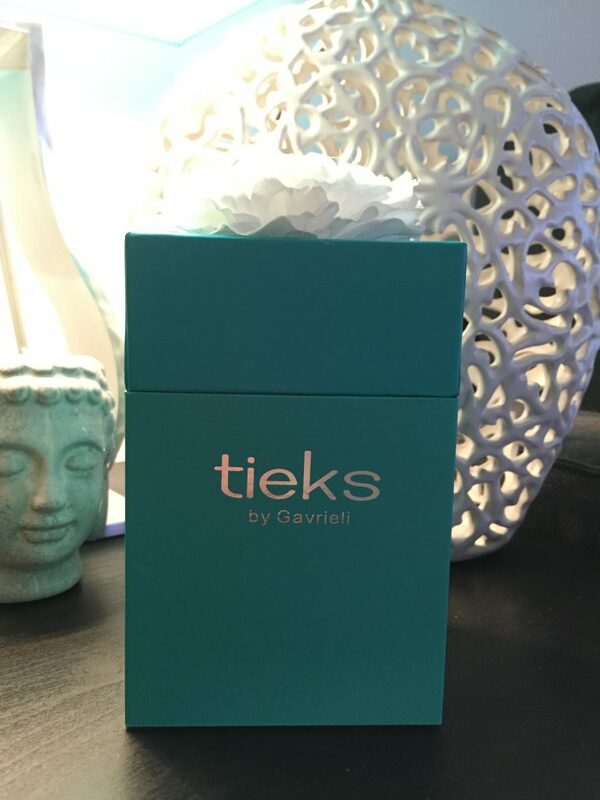 What are Tieks? They are a foldable leather pair of flats that you can take on the go with you. They also happen to come in the cutest packaging. b) It’s the same cookie cutter blog post with practically the same review/comments. When I was looking to purchase my own Tieks I did some Google searching and all the results were basically the same, making me question whether these shoes were really the answer to all my flat shoe prayers or if it was just too good to be true. I feel there’s a need to provide you with an honest review from someone who isn’t going to sugar coat things. I currently own 3 pairs of Tieks, but typically only wear one on a regular basis (Metallic Pewter). First thing to note, Tieks are pretty pricey with a price tag starting at $175. You need to make sure you’re ready to invest in something so pricey that may or may not work out for you. Flats are one of those items that are tricky to purchase, especially online and if you have narrow feet/ankles. My ankles are pretty small so I’m used to giving up the fight with flats because they always slip off my ankles and make me feel like I’m wearing flip flops since they flop right off and flip right back up at me. My default is to just put on my trusty Target sandals. Skinny ankles aside, I’ve wanted to look more mature in the office and I felt flats were worth investing in (and investigating). Alas, I gave into the hype and purchased my first pair. Initial reactions? The shoes were kind of uncomfortable, giving me blisters on my heels and the tight toe bed made my big toe on one foot noticeable through the leather. I even tried a size up thinking maybe I had the wrong size, but the larger size was too big and floppy. So, I took action and put on my fluffiest pair of socks and slipped on my Tieks to stretch them a bit, and I added stick on heel protectors inside of the shoes to cushion my heels and help with any potential blisters. This helped but it took several sock sessions and evenings out with my Tieks to make them feel comfortable. Nowadays I am walking around in my already worn in pair of Tieks without the stick on heel protectors after several months of use, which gives me hope that Tieks can become a staple in my wardrobe. I’m still wearing only one of my pairs on a regular basis because breaking in the shoes is sometimes too exhausting when most of my commute involves walking. No one wants to commute in and out of Manhattan with blisters and the back of flats digging into your ankles. Now on to one TMI topic I must address: Smell. 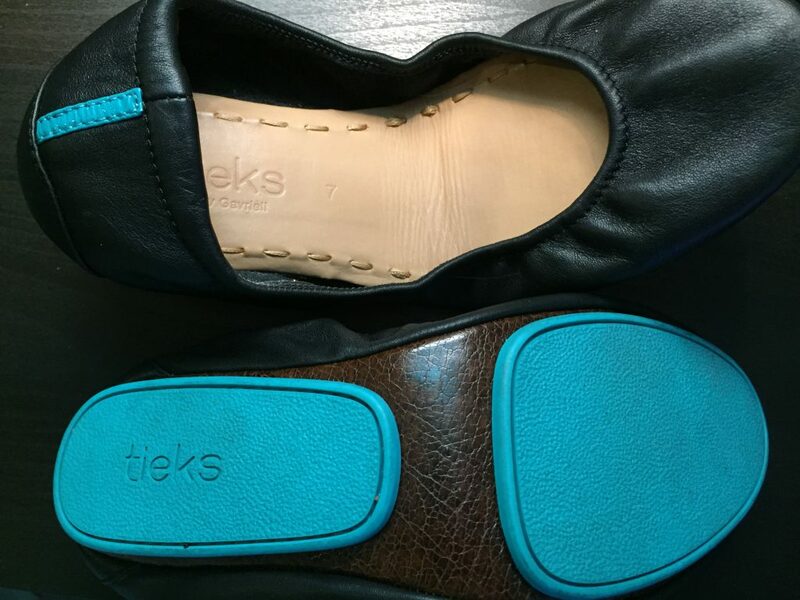 I don’t think I’m typically a sweaty foot kind of person but Tieks with their full leather construction make my feet heat up and get a bit sweaty, which leads to the leather (non-removable) insoles becoming worn and smelly. You don’t know how many Google searches I did to see if this was normal or if people had cleaning suggestions. Sadly, I always came up empty handed. Maybe I’m just special (weird), but I can’t be the only one with smelly Tieks! Sadly I don’t have a great suggestion to avoid them from getting smelly but I have found a couple products from Avon (Thanks Mom!) worth keeping on hand if you plan to do a lot of walking that have helped a bit. 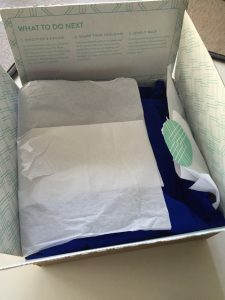 Next up on my journey of fresh smelling Tieks I’ll be trying a new product, Foot Petals: Sock-Free Saviors, that are removable and machine washable insoles! They are supposed to help with odor and be a great tool for shoes you can’t wear socks with, or rather not wear socks with (thinking of Keds). I’ll be walking around with the Sock-Free Saviors over the next couple of weeks so stay tuned for a review here! Tieks aren’t life altering as some reviewers will make you think, but they are fashionable and are a great alternative to heels or sneakers. I don’t feel like I’m walking on clouds but I do feel a fair amount of cushioning thanks to the eye catching cushioned blue bottoms. For me at least, they required a great deal of breaking in – they weren’t super comfortable or enjoyable right out of the box but if you’re determined to keep your Tieks, keep at it with wearing socks with them within your home until you get them just right. As many other ladies have mentioned, Tieks should consider creating half sizes. Half sizes might help with those of us who have slight complaints about the initial fit, and found that going up a size didn’t resolve the initial tightness. The price is on the high side, but it’s worth paying the price for a well constructed pair of flats. I do a lot of walking in my Tieks to and from work and the shoes have held up and still look brand new on the outside. Would I recommend them? Yes and no. If you have narrow ankles I would prepare for needing to do some extra breaking in. If you’re someone who typically wears new flats without issue, Tieks offer a great selection of colors with great cushioning. Happy walking! 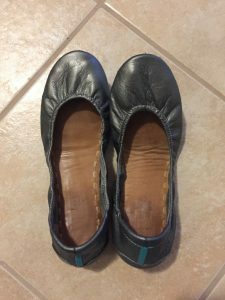 UPDATE (2/16/2019): Check out my latest “shoe” blog where I talk about Tieks vs Rothys. 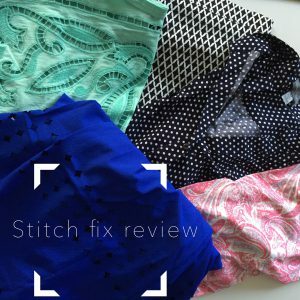 Stitch fix – a mixed bag, or should I say box? 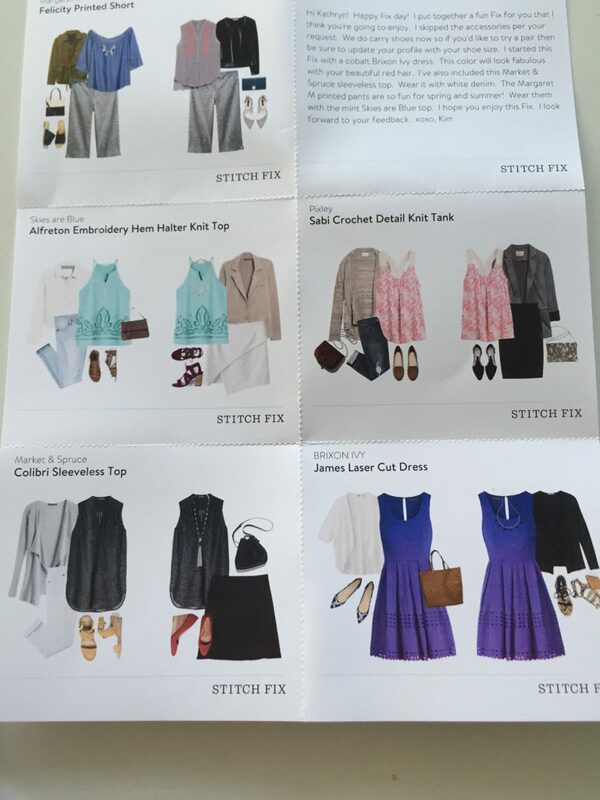 Quick intro to what stitch fix is: A subscription (or whenever you want to order a box) service for clothes and accessories. 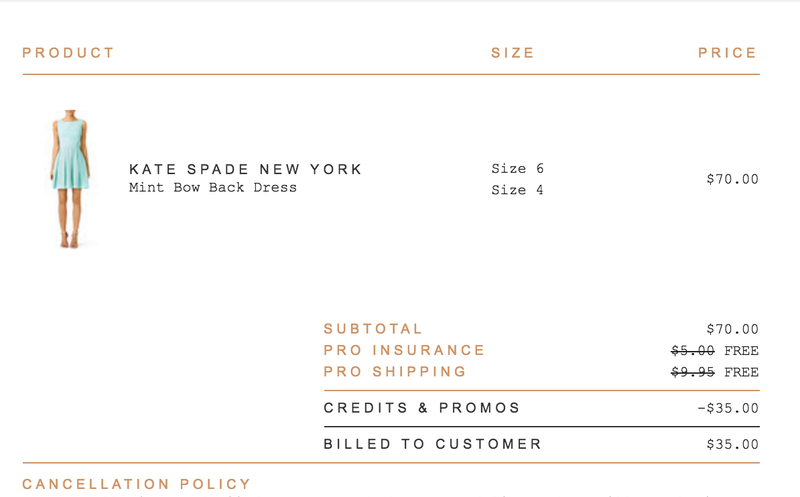 When you sign up you answer a few questions on your sizes, preferences, colors, and fill out a little note about yourself and your style. From there, you’re paired with a stylist – you never actually get to interact with this person 1 on 1 – who fills up a box with 5 items and sends it your way. You are given an opportunity to write a little note to your stylist requesting or suggesting items, each time you schedule a fix. Once you get the box, you try on the items, and send back whatever you don’t want within 3 days. A $20 styling fee is applied per box that you order. If you purchase anything, you’ll get that $20 off your “fix” total. If you find yourself in love with your fix and purchase all 5 items, you’ll get a 25% discount off your total bill. Most items I’ve received are between $40-100 (you can control how much you want to spend per item, but I’ve found most of my items tend to be on the pricer end). When you go to checkout you leave feedback for each item, helping your stylist improve for next time. A couple of weeks ago I received my 4th fix. 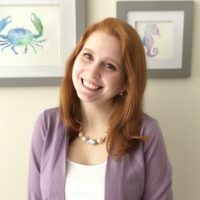 I’ve been meaning to write this post for a while, but work got in the way. For this fix I asked for no accessories. Last time I received a massive clutch, bigger than my head (I’m not a clutch person), and from there on I decided I was going to veto accessories and get clothes, which I care more about. 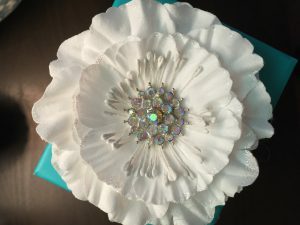 This time around I asked for 3 tops, 1 bottom, and 1 dress, providing a link to a brand new Pinterest board (Review Board) I created specifically for my stylist. For my previous 3 fixes I left everything up to the stylist, simply suggesting I wanted stuff I could wear to work and to go out with friends in the evening, but this time I wanted to show her pieces I’m interested in. Before I go further, I wanted to mention that my Pinterest board is mostly pins of clothes that Stitch Fix actually ships out to customers. There’s this handy dandy Facebook group where a bunch of ladies post pictures of the clothes they received. You can even trade, buy, or sell your Stitch Fix goodies in the group. Searching Pinterest I found a lot of the group members posted these pictures to Pinterest as well, so I just use those as inspiration. I was really hoping I would get some of the amazing tops I pinned, but alas, not a single item from my board was shipped my way. Out of the 5 items I received, 2 were keepers. I didn’t take pictures of them all individually because some fit really poorly. What I did end up keeping was a pair of Margaret M Felicity Printed Short, and a James Laser Cut Dress bright blue lightweight summery dress by Brixon Ivy. When I first pulled out the shorts I wasn’t sure about the length. I couldn’t tell where they should hit me so I took to Google to see if I could find a picture of someone in them, no real luck there. So, for all your Stitchers receiving these pants, I figured I would post a picture myself so you can get an idea of how they look. Now for the dress. The fabric is really interesting feeling and very lightweight. The only thing I can really compare it to is sports mesh like material, but it’s not that! I think this would be perfect for the office or for going out to see a show and dinner in the city. Next time I’m going to explicitly call out certain Stitch Fix items I want by name, hopefully that will do the trick!